The United States Congress designated the Carson-Iceberg Wilderness (map) in 1984 and it now has a total of 158,070 acres. All of this wilderness is located in California and is managed by the Forest Service. This Wilderness straddles California's Sierra Nevada Crest, divided between Humboldt - Toiyabe and Stanislaus National Forests. Here you'll find spectacular high country, with 12 peaks rising above 10,000 feet and numerous other peaks over 9,000 feet, broad river valleys, perennial creeks with small waterfalls, granite-strewn slopes, and several, meadow-filled valleys. Here are the headwaters of the East Fork of the Carson River, the Clark Fork of the Stanislaus, and the Mokelumne River. The Carson River, named for Kit Carson, and a distinctive granite formation called the Iceberg on the southern boundary give this area its name. You'll hike often in a thick forest of pines (Jeffrey, sugar, lodgepole, western white) and firs (red and white). Lakes, fairly common on the eastern side, are few and far between on the western side. Conversely, precipitation averaging 50 inches per year on the western slopes drops to about 15 inches per year on the eastern slopes, with about 80 percent falling as snow. Snowpacks usually linger into June, but the remainder of the summer is generally dry and mild with periodic afternoon thunderstorms and nighttime temperatures that could drop below freezing any day of the year. The Pacific Crest Trail runs the length of this area for over 26 miles. About 200 total miles of foot and horse trails give access to this outstanding Wilderness, where human use is light to moderate especially on the eastern (Toiyabe) side. 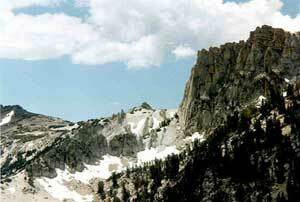 Planning to Visit the Carson-Iceberg Wilderness? How to follow the seven standard Leave No Trace principles differs in different parts of the country (desert vs. Rocky Mountains). Click on any of the principles listed below to learn more about how they apply in the Carson-Iceberg Wilderness.